The mission of the Law Center Archives is to collect, preserve and provide access to records with permanent value for purposes such as documenting the history of the Law Center, from its founding in 1870 to the present. 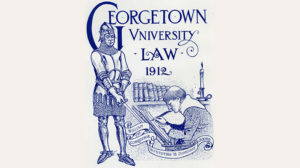 Many of these have been digitized and are available in Digital Georgetown. When records of permanent historical, administrative, fiscal and/or legal value are transferred to the Law Center Archives, the staff can provide safe and secure storage, quick retrieval when needed, and assistance with information or research requests. The archives staff is available to help Law Center offices identify records of permanent value for transfer to the Law Center Archives.